Douglas Brinkley’s The Wilderness Warrior celebrated Theodore Roosevelt’s spirit of outdoor exploration and bold vision to protect 234 million acres of wild America. 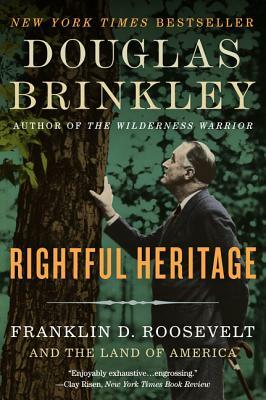 Now, in Rightful Heritage, Brinkley turns his attention to another indefatigable environmental leader—Teddy’s distant cousin Franklin Delano Roosevelt—chronicling his essential yet undersung legacy as the founder of the Civilian Conservation Corps (CCC) and premier protector of America’s public lands. FDR built from scratch dozens of state park systems and scenic roadways. Pristine landscapes such as the Great Smokies, the Everglades, Joshua Tree, the Olympics, Big Bend, the Channel Islands, Mammoth Cave, and the slickrock wilderness of Utah were forever saved by his leadership. Brinkley traces FDR’s love for the natural world back to his youth spent exploring the Hudson River Valley and bird-watching. As America’s president from 1933 to 1945, Roosevelt, a consummate political strategist, established hundreds of federal migratory bird refuges and spearheaded the modern endangered species movement. He brilliantly positioned his conservation goals as economic policy to fight the severe unemployment of the Great Depression. During its nine-year existence, the CCC put nearly three million young men to work on conservation projects—including building trails in the national parks, pollution control, land restoration to combat the Dust Bowl, and planting more than two billion trees. Within the narrative are brilliant capsule biographies of such environmental warriors as Eleanor Roosevelt, Harold Ickes, and Rosalie Edge. Rightful Heritage is essential reading for everyone seeking to preserve our treasured landscapes as an American birthright. A marvelous book; one of Brinkley’s very best. FDR’s conservation achievements helped preserve the nation’s natural bounty and made it accessible to citizens as never before. By telling this grand story so well, Brinkley provokes readers to appreciate how the national government can perform wonders of its own. Following his definitive look at Teddy Roosevelt’s passion for wilderness conservation, Brinkley now brings us a colorful, exciting narrative of how his cousin FDR carried on the cause. Brinkley gives us a wonderful, timely new perspective on FDR; his wife, Eleanor; and the dedicated environmentalists around them. With this engaging book, Brinkley recovers one of FDR’s long-overlooked legacies: stewardship of America’s natural resources. This is a vivid history of an important subject. We are lucky that Brinkley has turned his attention to the Roosevelt we do not generally associate with the preservation of our environment. Stunningly researched and compellingly written, Rightful Heritage tells the story of FDR’s love affair with the American wilderness. In our search for compassionate and clear-headed leaders to guide us through the environmental crisis, Brinkley’s vividly detailed account of Roosevelt’s pioneering preservationism serves as a much-needed beacon and bible. Rightful Heritage is an irresistibly powerful and beautiful tale of America’s fraught love affair with its land, told by one of our most gifted historians. Brinkley follows FDR on an astonishing journey that, despite war, depression, and political infighting, somehow preserved what is most precious to us.